A very unusual and striking camellia. The small, single, white flowers are tinged pink and scented, but it is the low-growing and spreading growth habit that makes it special. Quintessence will never grow tall, but makes a rounded bush that is perfect for a container, the front of a border, or a rockery. 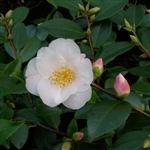 Nice Camellia and quick and good shipping to the Netherlands. These are really gorgeous and not commonly available camellias and I am delighted to have them. They arrived in perfect condition. This camellia quintessence was a gift. I therefore have not seen the plant myself, but have been assured by the recipient that it is beautiful and arrived in a good state. I really can recommend Trehane Nursery. The whole online process was easy and efficient and, when I had to change the delivery date, I got a prompt reply and it was dispatched and delivered exactly as I had asked for. I was also notified by the nursery when it had been dispatched and when it had arrived. An excellent shopping experience! Another odd looking plant with hanging branches. Will be displayed hanging in my observatory and surely admired. Received plant with both flowers and buds and arrived in excellent condition. All my thank's to Trehane's excellent packing and handling of the parcel! I'm always impressed by the quality and size of the camellias, and this order was as good, if not better, than I expected.